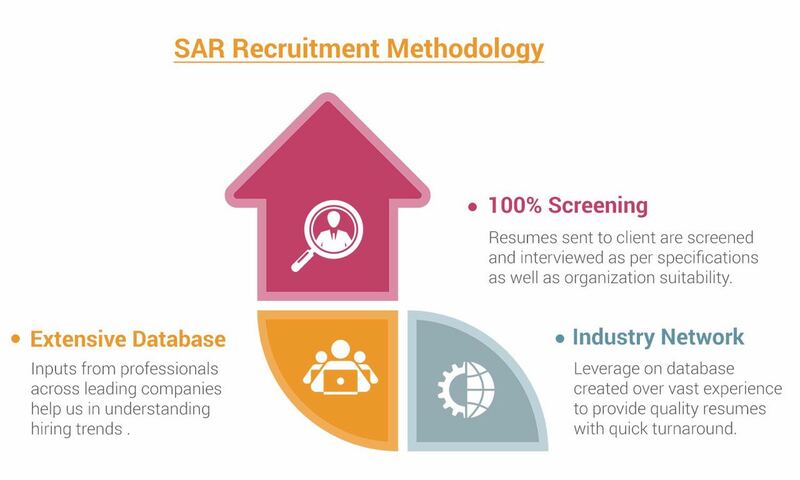 SAR HR CONSULTANCY has been established since 2003 by highly experienced professionals who have worked with SEI CMM Level 5 company and have extensive experience in HR. The company is an executive recruitment firm specializing in middle and senior management levels. In a short span, it has established an excellent track record in IT, Manufacturing, Financial Services,Retail and Telecommunication verticals. We are an extension of our client’s HR team and must perform as a responsible representative of their organization. SAR HR Consultancy is an entrepreneurial venture of Mrs. Sudesh Dhingra who has served DCM Technologies, SEI CMM Level 5 company for 25 years & is exposed to various HR practices including PCMM. Our team carries experience in – sales, marketing, human resources, finance and operations. The average experience of the organization is 5 years and we have placed more than 400 people giving them a corporate functional exposure. TEAM SAR shares a common characteristic: a passion to excel. This is precisely reflected by our dedication to understand our client’s business processes. That again is the reason why we invest time and energies into building long-term relationships with professionals and assist them in fulfilling their career aspirations. This results in highly customized service offering. We focus on developing and nurturing deep, long-term relationship with clients and candidates because strong relationship leads in exchanging the best ideas and informed options with broad access to the most talented leaders. Our clients value us for our deep expertise, valuable insight, honest advice and commitment in their success. Nearly two-third of our assignments are for our existing clients. We consistently assess client satisfaction after the assignment to evaluate ourselves which help us in improving our performance. Our mission is to provide seamless services and quality resources on very a competitive pricing.